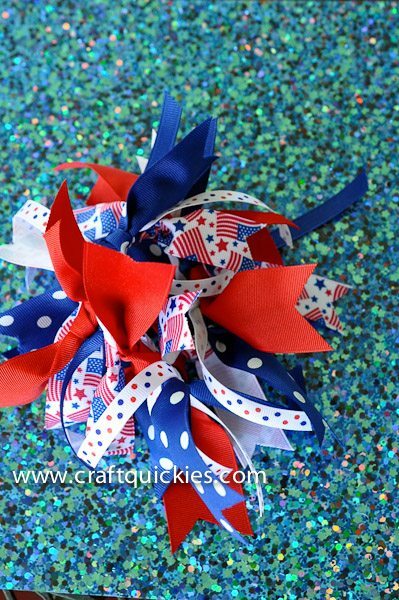 Firecracker bows are easy to make and perfect for any holiday! Make some for your little girls using this simple tutorial. *I received these ribbons free of charge from The Ribbon Retreat. The idea, tutorial, and opinions are all my own. I grew up in a family of three girls. We always fancied our home to be something akin to Little Women. Lots of “plays,” make believe, dressing up, roughhousing, singing, arguing, and LOVE! It was so fun! And my mama always enhanced and facilitated that fun by providing us with a “dress up box,” creative birthday parties, endless patience for watching our lame made-up plays, and by creating fun holiday traditions. 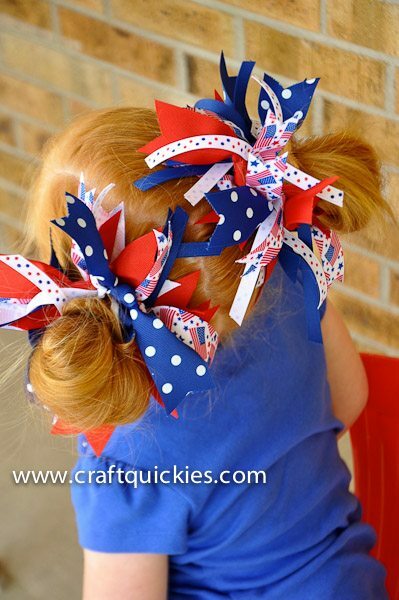 One of my favorite things that she did for us at holidays was making us “Firecracker Bows.” It started as a Fourth of July idea (hence the “firecracker” nickname), and people loved them so much that all three of us ended up with Firecracker Hairbows for every holiday. One year my mom and I even made them in our school colors for my entire drill team and we all wore them with our uniforms when we were performing at football games. These bows are so cute, versatile, and EASY! 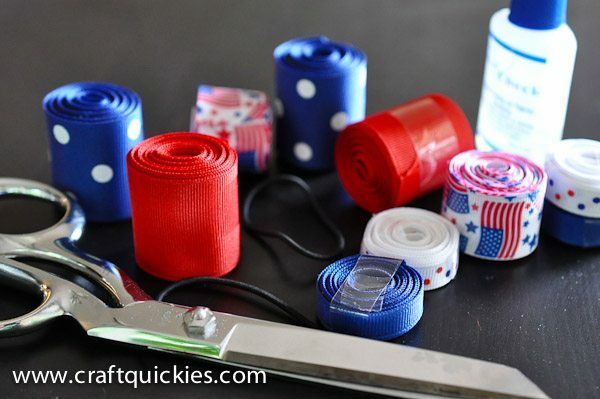 You can make them from ribbons, which is the original way that my mom made them and definitely the classiest looking option, or you can use fabric scraps and pinking shears. You can see what that looks like by visiting the Halloween Bow tutorial that I posted on my blog last fall. Isn’t my model insanely cute? I couldn’t resist recruiting her again! Ready to make your own? Seriously, you will be done by the time you finish reading this blog post! 1. Gather up hair elastics and the ribbon that you plan to use. 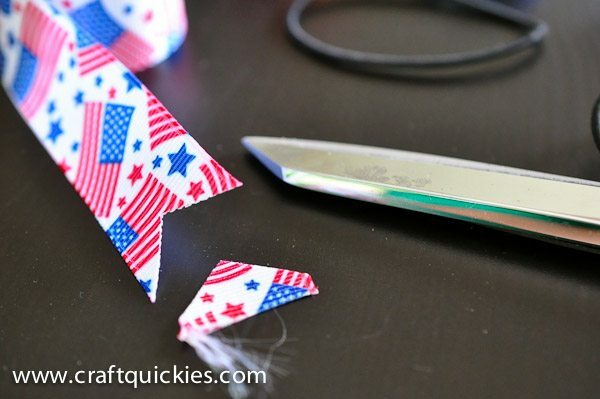 I used a package of the American Pride Seasonal Ribbon Mix from The Ribbon Retreat. It was the exact right amount for two piggy-tail hairbows that were VERY full! 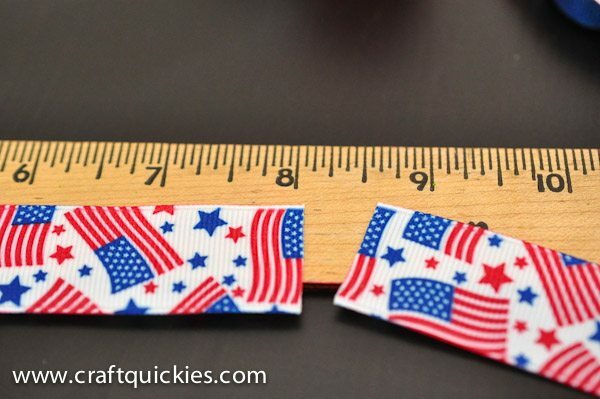 There are several options of patriotic seasonal ribbon mixes at The Ribbon Retreat, and they are all very cute! 2. Prepare by cutting the ribbon to your desired length. My strips were approximately 8 inches long. I was not precise about the lengths, because I think it is fun when there is a bit of variety of size and length in these bows. 3. 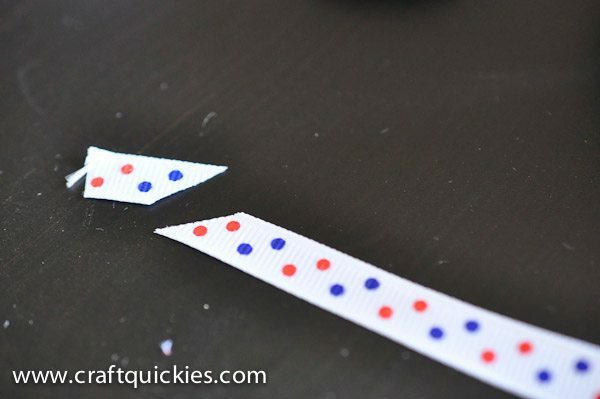 Trim the ends in a cute way if desired. 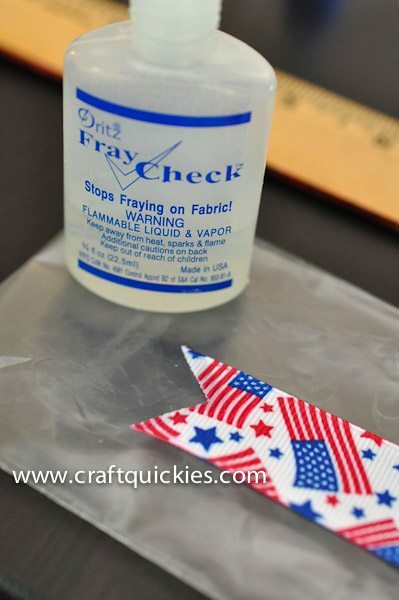 You can choose to use Fray Check at this point to seal the edges of the ribbons. They will hold up much better if you do, but you will have to wait for them to dry if you do so. 4. 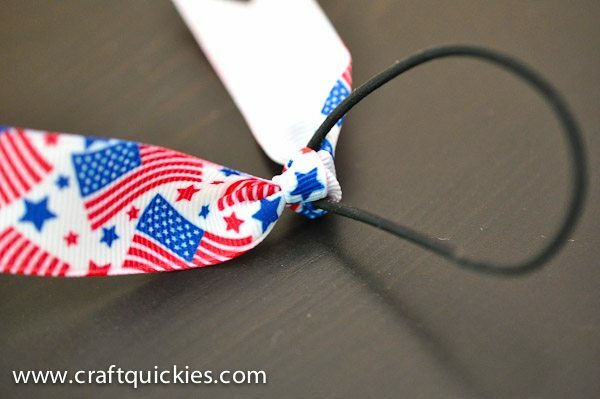 Tie the ribbon or fabric strip in a knot around the elastic. Repeat over and over. Yes, it is THAT easy! Amazing, right?! I love how full they look, and I LOVE this cute little model! 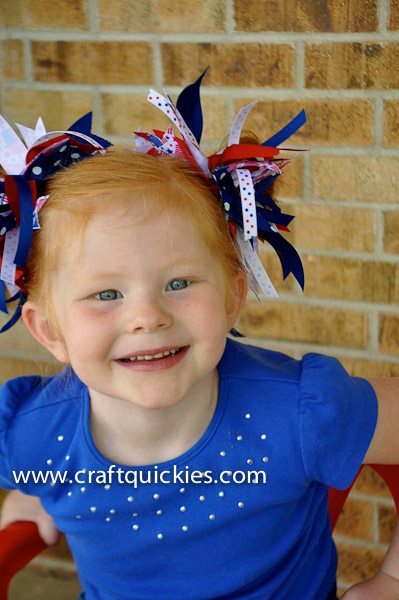 She is the daughter of my dear friend, and she is just as feisty and fun as her red hair suggests! 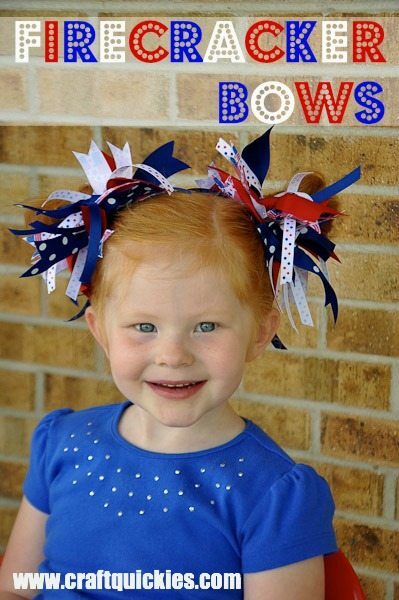 Love The Firecracker Bows? Try my Baby Headband! Irresistible!! Love them on the pull-through buns, that styling is so sweet & comfortable for a little one. I’m going to have to use this for Matilda’s next dance recital!!! These are adorable. If I could get my daughter to let me put her hair in pony tails I would totally make some! You’re amazing. Thanks for posting this. I really dig it. It is this kind of cuteness that makes me a little ornery about having three boys! (Luckily I have nieces!) Thanks for sharing at the Summer Inspiration Link Party!! Hahaha. My cousin Amber always says the same thing! I know this was supposed to be a super simple craft, but I have a question! Did you tie ribbon ALL the way around the elastic? If so, how in the world do you get the bow into her hair? Does it only work on buns? I was trying to make a ponytail with my daughter’s hair (it is thin hair), but am having trouble getting it around tight enough to stay. Hi Holly! I did them all the way around with small elastics. I have thick hair, so I haven’t dealt with this. I would try putting a normal elastic in to hold the pony in place and using this on top. You could even use a few bobby pins to hold it in place. This is too cute! I loved when my mom made me matching hair bows for my outfits as a child 🙂 Thank you so much for joining the party at Dishing It & Digging It!